Municipal solid waste (MSW) is the waste generated by public. Without significant recycling activity, it predominantly includes food waste, market waste, yard waste, plastic containers and product packing materials and other miscellaneous solid waste from residential, commercial, institutional and industrial sources. Municipal waste needs to be efficiently handled to avoid serious health, hazards to public and also generate revenue out of waste. Composting is nature’s way of recycling. Controlled process hastens this natural decomposition of organics. The final product is compost which has an earthy aroma. Composting significantly reduces the quantity of waste being diverted into landfills. Alfa-Therm Limited is a leading manufacturer offering latest modern mechanized plants for MSW processing which process and convert organic matter into compost with capacity 2 tons/day to 2000 tons/day based on windrows composting. The process involves pre-processing yard/windrows/shed management, processing and refinement before final packing of high quality compost. The plant incorporates apron feed regulate conveyor, feeding conveyors of several design, tromell screens, bucket elevators, Aerobic gravity separators, ferrous and non ferrous separators, drag chain systems, destoners and several other automation equipment to reduce manual handling and increase productivity. Refuse-derived fuel (RDF) is a fuel produced out of MSW using processing equipment. The RDF can be used alongside traditional sources of fuel in coal, cement and power plants. Non combustible material is removed in the plant and processed RDF is sold in the form of fluff, pellets or bales as per the customer requirement. The RDF plants are manufactured by us up to 150 TPD Capacity. 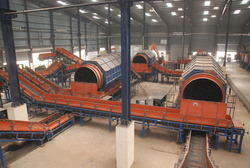 The RDF plants are fully automatic using high technology equipment. The twin shaft shredders are versatile shredders designed for shredding Municipal waste in the primary stage. The shredders are extremely rugged and have a strong support structure to withstand all loads. Shredders are available in a wide range of electrical and hydraulic drive configuration. Feed conveyors and output conveyors can be provided. The housing is solid construction, bolted together. The shredders have low speed, high torque, low noise, low dust and low maintenance. The heavy duty shredders are manufactured by us up to 15 tons/hr capacity. We are the supplier of the Balers for waste material baling upto 6 tons per hour. TROMMEL: This is the rotary screen which separates material on the basis of size. Oversize (reject) material will be carried to RDF/landfill and undersize (accept) material forwarded to the next process. DESTONERS : A mechanical destoner is used at the end to separate the stones from the material and ready compost is dropped from the other end of the destoner for packing and sale.